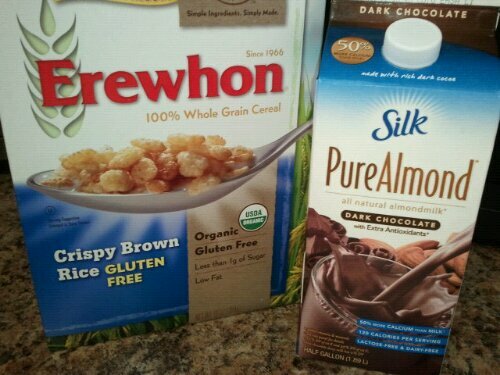 I didn’t really have a plan for this dark chocolate almond milk when I bought it, but as soon as I spotted it on the shelf, I had to have it. The next day Thomas was about to pour himself a bowl of brown rice crispies and I just about jumped out of my chair with excitement! You may or not already know that good ole Kellogg’s Cocoa Krispies are accidentally vegan, but you probably wouldn’t want to buy them anyway because the ingredients are: [white] Rice, [refined] sugar, cocoa processed with alkali, contains 2% or less of semisweet chocolate (sugar, chocolate, dextrose) [otherwise known as sugar, chocolate, sugar], partially hydrogenated vegetable oil (coconut, soybean and/or cottonseed), salt, malt flavoring, artificial flavor, BHT for freshness. Plus a bunch of vitamins & minerals added to boost their nutritional panel.